In the insurance industry, customers want especially fast, high quality, professional service. For this reason, you need a call center software that can provide your agents with the information that the need on client accounts. This way, they can use their time efficiently and deal with a high volume of calls in a short amount of time. Nectar Desk provides the best solution for your business. With our multiple CRM integrations, you can be sure that your agents will be able to access all of your customer information in the cloud and link it to calls in real-time. Add client notes directly from Nectar Desk so that all of your agents are properly updated the next time they receive a call. Monitor your agent activity with our deep analytics dashboard. 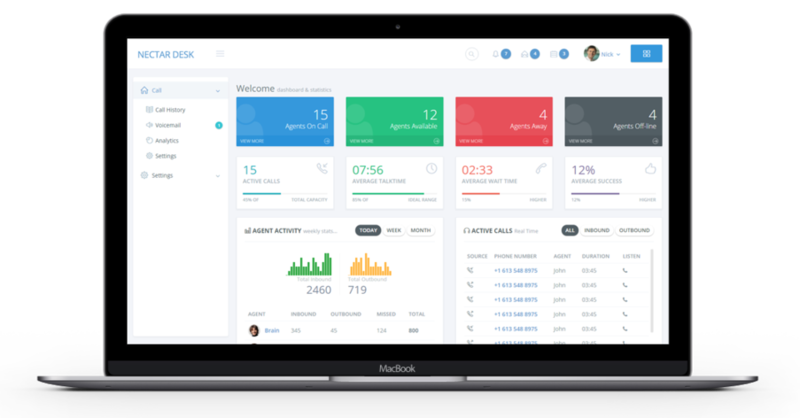 Check in on key metrics such as the number of inbound calls handled, average answering time and agent statuses. Use these features to assess the quality of your agents and adjust staffing as required. Get started with Nectar Desk today to take advantage of all these features and make your insurance call center more efficient.